A few days ago I received a little package from MaxFactor with some products that I had wanted to try and other extra bits. Unfortunately, the skin base products were extremely dark for my complexion but that didn't stop me from loving these other three. Hace unos días recibí un pequeño paquete de MaxFactor con algunos productos que quería probar y otras cosas más. Desafortunadamente, los productos de base eran muy obscuros para mi tono de piel pero eso no me detuvo de amar estos otros tres. The Masterpiece Max Mascara went beyond my expectations. I have the smallest lashes that face downwards and the formula in this really holds the curl in a very natural way. It caught my eye that it says it is a good choice for contact lens wearers, which I think it is because it didn't get in my eyes at all (like it always does). What that I loved the most was the Facefinity Primer, it was exactly what I though it would be like. I had seen a lot of bloggers talk about it, I tried it for a few days at the beach with the hottest weather and my makeup stayed in place all the time. It also contains SPF so keep an eye on that if you're going to wear it at night. If you're illuminating blushes, then this is for you. The Creme Puff Blush is one of everyone's favorite cheek products because they resemble the Hourglass Ambient Lighting blushes. I got the shade Lovely Pink which has a soft pink and yellow shades that give a peachy glow. La Máscara de Pestañas Masterpiece Max excedió mis expectativas. Tengo las pestañas más pequeñas que apuntan hacia abajo y la fórmula en ésta mantuvo el rizado muy bien con apariencia natural. Me llamó la atención que dice ser apropiada para usuarios de lentes de contacto, lo cual creo que es real ya que no manchó mis lentes (como siempre sucede). Lo que más me gustó fue el Primer Facefinity, resultó ser exactamente lo que creí. Había visto a muchas bloggers hablar de este, lo probé por varios días en la playa con el clima más caluroso y mi maquillaje se mantuvo en su lugar todo el tiempo. También contiene FPS por si piensan usarlo de noche lo tengan en mente. Si te gustan los rubores que iluminan entonces este es para ti. Los Rubores Creme Puff son de los favoritos de todas para las mejillas porque tienen una gran similitud a los Ambient Lighting Blushes de Hourglass. Aquí tengo el color Lovely Pink, el cual tiene tonos rosa claro y amarillo que dan un iluminado melocotón. Here you can see the Creme Puff Blush, the glowy particles are a bit noticeable but fade away as you blend it out. It has a sheer formula that lets you build up the color slowly. 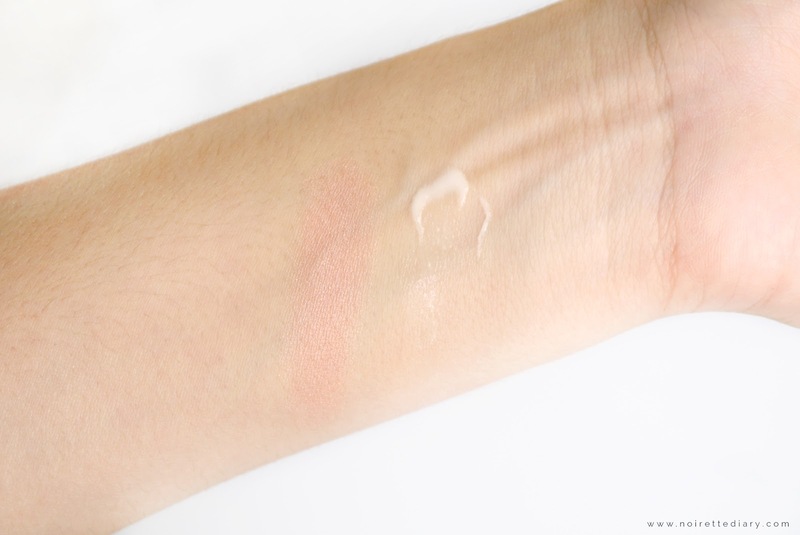 The Facefinity Primer has a liquid consistency that gets absorbed immediately into the skin. It's very lightweight so you don't have to worry about ending up with a cakey finish. Aquí puedes ver el Rubor Creme Puff, las partículas brillantes son un poco más obvias pero puedes esparcirlas mientras difuminas más. Tiene una fórmula muy suave que te deja ir armando el color poco a poco. El Primer Facefinity tiene una consistencia líquida que se absorbe de inmediato a la piel. Es muy ligero y no te tienes que preocupar de terminar con un acabado pastoso. 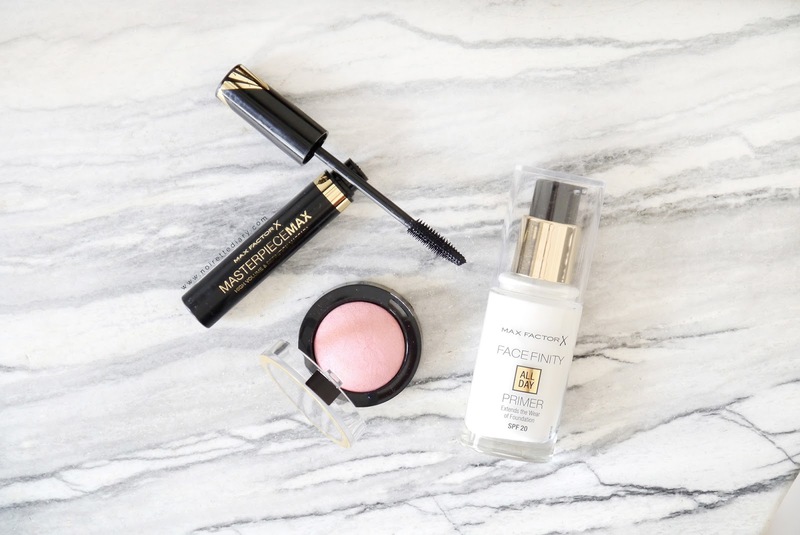 Which of these MaxFactor products have you tried? ¿Cuáles de estos productos de MaxFactor han probado?